The Vancouver Farmers Market at Trout Lake and Kitsilano held a Tomato Festival this past weekend. I attended the Trout Lake one to see all the different types of heirloom tomatoes being sold. There was a table full of tomatoes where visitors could vote for the biggest, most beautiful, most ugliest, and most shapely tomatoes. This one was going for most beautiful. So was this one. It has a really nice mix of colour! Everywhere I looked there were tomatoes. 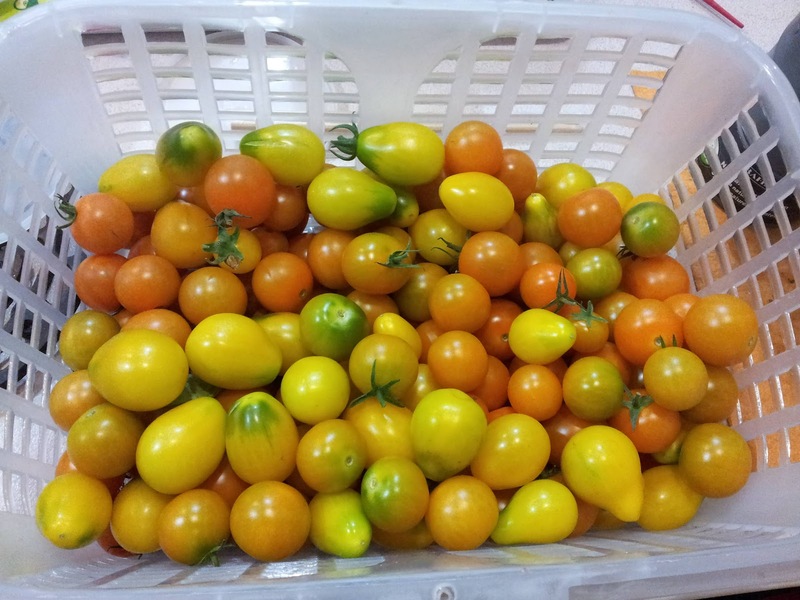 Look at these Sungolds from Tomato Man! So orange! Mmmm! So good! A lot of tomato facts were posted up around the market. I learned a few things! Of course, it wasn't just tomatoes that are in season, lots of other vegetables and fruits are in season too. I saw a lot of squash. Since I'm on the subject of tomatoes, here is my own tomato harvest! Mmm Sungolds! The dentist longview tx told me that you will get a lot of health benefits in eating tomatoes cause apart from the good result it'll bring you on your skin it'll also help your teeth become strong. On the contrary, my boca raton cosmetic dentist told me that you could not eat tomato by itself because the said fruit is very acidic, that may damage our tooth enamel. I've just got my one day dental implants and my dentist advised me to eat a lot of fiber-filled foods to keep my newly-operated teeth intact and to also protect my oral condition cause it does strengthens my teeth's hold to my gums.